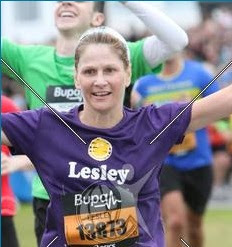 On Sunday 16th September 2012 I ran the Great North Run for the second time. So how was it? In short, awesome! Last year I can categorically say I didn't enjoy it at all and I even said after I crossed the line "Never again!" ... so what happened? Well I think it must be a bit like child birth - during the actual event it seems horrendous but once you have the bling around your neck the pain is soon forgotten! I also did a lot more training this year as I am running a marathon in 3 weeks! The day before the GNR I had to travel the 200 mile round trip to Newcastle to take my son to Uni, very stressful in itself - packing, unpacking and saying fond farewells and then by the time I got home on Saturday evening I just had enough time to carbo load with a meal of Spaghetti Bolognese and garlic bread and relax in front of the TV for a short while before going to bed. I didn't even have a pre-race relaxing glass of wine! I never sleep well the night before an event and this was no exception! I think I saw the clock strike every hour on it's way round to 6 O'clock! Timing chip to attach to my laces! This year I was travelling to the event with a friend (her 5th GNR) whose husband was very kindly being our chauffeur. The arrangement was that I would be collected at 7am, so I set my alarm for 6.20am to give me time to make and eat my porridge and check I had everything. I was awake however way before my alarm went off and I was relieved when it was finally time to get up. I forced down my porridge and a coffee, gathered what I needed for the day, secured my timing chip to my shoe lace (each runner is issued with an electronic timing tag that attaches to their running shoe. The tag is triggered as you cross the start and finish lines, giving an individual and accurate post-to-post time), but I left my bib number off my T shirt as it is quite flimsy and I didn’t want it to get all scrunched up or torn with the seat belt in the car – I just had to ensure I didn’t leave it behind (That would be a disaster!). Just as 7am came I got a text to say they would be late! Time to relax ... or pace the room in my case! I checked the weather forecast and found it wasn't good! They didn’t arrive until 7.30am and I was getting fairly anxious about time by this point. If the traffic was bad would we make it in time? Time to take deep breaths ... and relax! Luckily the traffic was flowing well and we were dropped off fairly close to the start at around 9:45am in plenty time for the 10:40am start (although the assembly points closed at 10:30am). On arrival we had a 20 minute wait to visit the little girls room (which certainly won't be getting an award for the cleanest loo! ), and then made our way over the bridge to the assembly points. We were both in Orange section zone D, which was the third zone back after the Elite and celebrities zones. We arrived at the correct zone with only about 10 minutes to spare at around 10:20am! To gain entry to the coloured assembly zone you must be wearing the correct colour and letter race bib for the zone you were going into, they were particulary meticulousness about this, you were allocated your zone colour according to your predicted finish time! We were packed into the "cages" like sardines. Being in a "faster" zone this year meant I wasn't surrounded by as many "fancy dressers" as last year but there were still a few scattered amongst us. 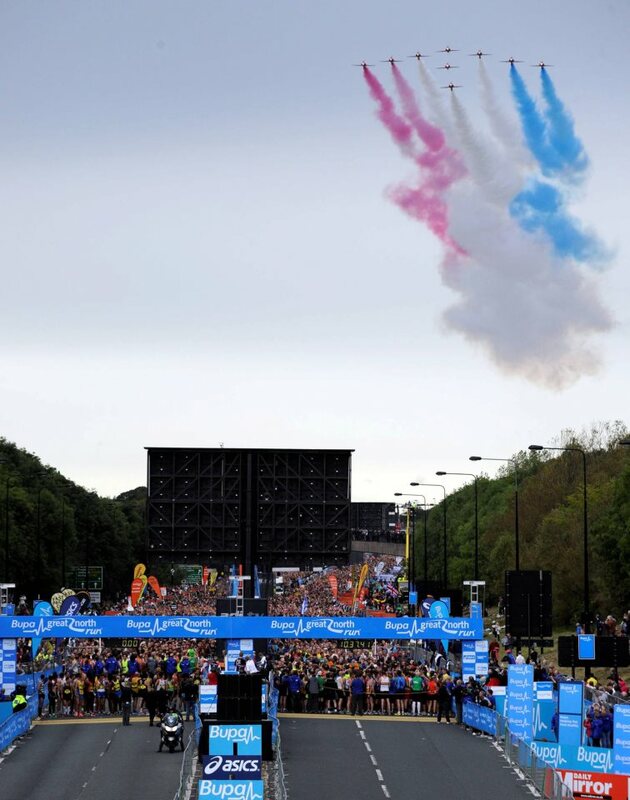 The Great North Run is now one of the most iconic road races in the world, and conditions were near perfect for running (and no rain as yet!) as we lined up on the central motorway in Newcastle for the start. The Red Arrows drew a spontaneous round of applause as they flew over the 39.953 strong field assembled at the start and emotions were running high. 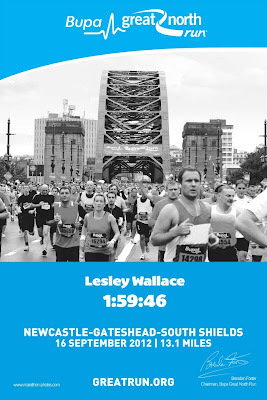 This was my second crack at the GNR after a pretty awful attempt last year, and my fifth half-marathon since then! 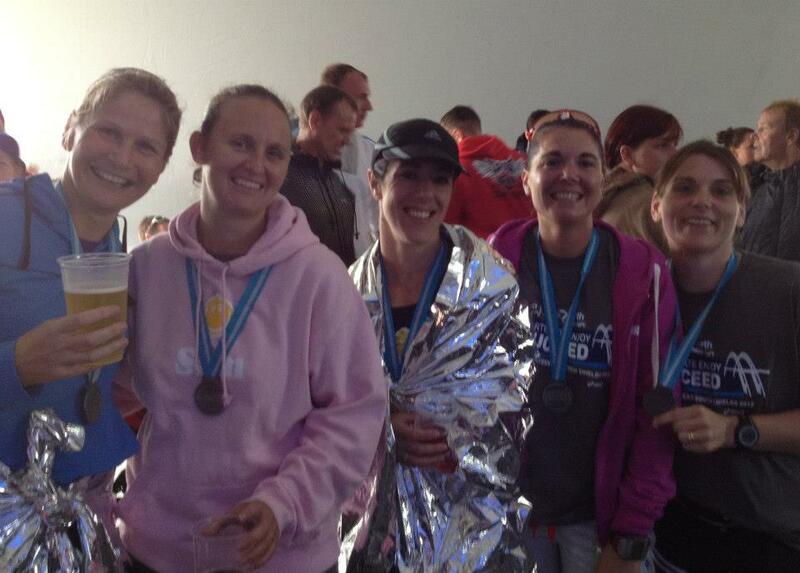 I was meeting friends in the beer tent at the finish so there was an incentive to get round as quickly as possible! however it was very difficult to join in with so many people in close proximity! I was afraid of taking someones head off or getting an injury myself! I took this opportunity to say Good-Bye and Good Luck to my friend Sharon before we lost each other in the masses and agreed to meet in the family reunion area by the letter B for her surname! I wasn't making the same mistake as last year and wasn't going to trek to W for my surname which was the furthest away at the botton of a hill - meaning I had to climb back up the hill afterwards! This year Mo Farah was joined by North East Olympic gold medal winning rower Kat Copeland, long jump champion Greg Rutherford, boxing sensation Nicola Adams and Paralympic swimmer Ellie Simmonds as honorary starters. After a short spell in the starting pen, the gun was fired and the field charged off down the hill towards Newcastle. Many people diverted to the central reservation at the start gantry to high five Mo Farah and the other celebrity starters as they passed, I decided not to bother and concentrated on running over the line and remembering to set my Garmin! Just as my foot passed over the start mat I felt the first drops of rain - typical! Last year I had set off running down the right hand side of the carriageway which meant going over the flyover, this year I opted for the left hand side meaning you go under the flyover where everybody took part in the famous "Oggy Oggy Oggy" chant (and in my opinion it meant one less hill!). I was conscious that the first two miles are quite sharply downhill so just tried to let the legs turn over without getting carried away by the crowd. I was amazed how many people even at this early stage in the race were walking - surely they were in the wrong starting zone if they had to walk before the 2 mile point? All this does is inconvenience and to some degree endanger the other runners who are having to use up energy to swerve, side step and dodge these inconsiderate participants. There is no crime or disgrace in walking but why put yourself in the time zone where the majority of runners are chasing a sub 2 hour finish! Crossing the Tyne Bridge there were crowds around ten deep on either side of the road cheering the runners on. The organisers had printed my name in big letters above your race number so the crowd could give you a personal lift and I was wearing a T shirt with my name printed on! No reason not to get lots of personalised support! 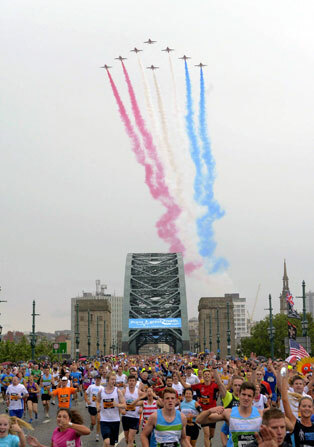 Just as I emerged from crossing the bridge the Red Arrows roared overhead for the iconic flypast and apparently Red 8 did the Tyne Bridge fly past and then hot footed it to the startline to complete the 13.1 miles on foot! Just after crossing The Tyne Bridge at around 2 miles I faced the first uphill of the race. I remember thinking last year "OMG it's a hill" this year I seemed to effortlessly get to the top and by this time the rain had really set in! The spectators weren't deterred and there was still plenty lining the streets shouting encouragement and offering jelly babies etc. At around mile 3 I passed the first of many "bands on the run" and before I knew it I had completed mile 3 and had only 10 miles to go! I had opted to run naked this year - DON'T PANIC - I'm meaning music wise! I decided to enjoy and soak up the atmosphere and thought that wearing head phones would detract from the whole experience. It was good motivation to hear geordie voices calling out your name as you passed! There was also many children offering there hands for high fives, which made me chuckle and smile and I felt like a celebrity high fiving them as I ran past! Also around this point it was time to grab a water bottle. I was chuffed to see that the bottles had "sport lids" which meant I could run and sup instead of the usual giving myself a drenching trying to negotiate running and drinking! However, many of the discarded water bottles still contained water and the local children were finding it hilarious to pick them up and fire the remaining water at the runners as they went past! I was wet from the rain and I really didn't appreciate an extra soaking - maybe if the sun had been shining it would have made me smile instead of scowl! At mile 4 I glanced left and saw the legendary Gateshead International Stadium where apparantly the race organiser Brendan Foster broke the 3,000m world record here back in 1974. I continued steadily and I still felt good. At around Mile 6, after Black Bull junction I had conquered the highest point on the run and then enjoyed a 2 mile steady downhill section! It was nice to know I was more than half way and I still felt full of energy! At around mile 7 there was a charity cheering zone where all the individual charities involved had decorated buses and were waving and cheering all the runners running on their behalf! It was good to focus on all the different reasons people were running this event, and I felt quite emotional! After this there was several more "Bands on the run" stations to distract me as well as a shower station! I didn't bother going through as I was already as wet as I could get, but many people did! By this point there was more and more runners walking and many first aid people being kept busy! I was amazed how much better I felt this year compared with my first attempt last year! Just before mile 12 there is a nice long hill to run down (although with the ground being so wet I was reluctant to go too fast in the fear of landing on my ar**, especially as I was aware of TV cameras!!). Coming down this hill I got my first glimpse of the sea, and at the bottom there was a big sign stating the obvious "turn left! ", you had no alternative unless you were going for a dip in the sea, shortly after this there was another sign with "MILE 12" on! I was nearly there - only a mile to go! Turning onto the seafront the crowds were fantastic and were all shouting encouragement. Glancing at my watch I realised if I wanted to get a sub 2 hour time I needed to increase my leg speed slightly. My legs and head were having an argument, my legs were wanting to go slower or stop and my head was telling them to be quiet and do some work instead of moaning! Luckily for my legs the long stretch to the finish line was very congested with very slow runners and walkers as well as water bottles littering the road so I was unable to execute the sprint (ha ha) finish I so desired! As well as contending with the slower runners I also had a problem with MEN who were desperate for a PB and came barging past literally elbowing me out the way whilst I was doing the very British thing and politely waiting for a space to open up to move in to! GGGGGRRRRRR! I tripped over a discarded water bottle very near the end and I thought that was me gone but luckily I managed to keep upright and cross the finish line with the victory waving of the arms in the air! 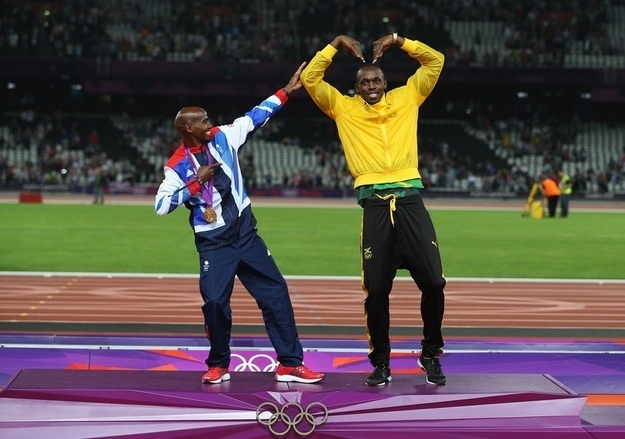 The finishing commentator was encouraging up to do the mobot on finishing but I decided against this! I was delighted to see when I stopped my Garmin that I had managed a sub 2 - just - with 1:59:54 and I preyed that my official time was under 2 too! I got a text to my mobile confirming my official time and was delighted that it was 8 seconds faster than my Garmin at 1:59:46. 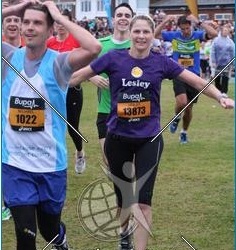 Just as I crossed the finishing line the rain decided to stop! Typical! Red Arrows impersonation do you think?!! Last year when I passed through the chip collection point a nice young man took pity on me and bent down to remove my tag on my behalf, I obviously looked better this year as they left me to do it myself! After this I moved on through to collect my goody bag containing my medal, t shirt, foil blanket, energy shots, energy drink, a cereal bar and some pistachios and made my way to the reunion point to meet up with Sharon! Sharon was already there waiting for me after getting a PB of 1:51:06. I was beginning to get cold by this point so I wrapped myself in the foil blanket, like a Turkey ready for the oven and we made our way to the Beer tent - we deserved a pint ..... or several! On our way to the beer tent we saw the Red Arrows do there final fly-over! We had arranged to meet other running friends here and ended up being very sociable and staying until about 5.30pm! Considering we had finished the race by 1pm this is quite a lot of drinking time! Running a half marathon + no lunch + several pints = not a good idea! BUT WE HAD FUN and I hope to be there again next year for a repeat performance but only faster! You can view my run on my Garmin here!